The average full service lodge in Alaska charges over $7,000. Per week. The average fly-out lodge is closer to $10,000. There is good reason for these seemingly ridiculous prices. Alaska is expensive. A gallon of milk is $10.00. Necessities like lumber for building cabins and propane for heating them is as much as 4 times more expensive than in the lower 48. I still have trouble buying a can of soda at the grocery store without cringing. When we decided to start this business in Alaska, we knew that our biggest challenge would be to keep it affordable. I have always believed that the majority of fishermen are just like me – we all want to fish Alaska, but we don’t want to sell our cars to be able to afford the trip. I have to admit, I was ready to put together a wilderness tent camp. I wanted a camp that sat right on the riverbank of a river that would offer home water full of big rainbows, that would get all 5 species of salmon and that would offer our guests a chance to catch arctic char and grayling as well. A place that we could jump in a jet boat and visit a variety of great fishing rivers and streams without the need to board an expensive float plane, allowing us to fish no matter what the weather conditions. But my lovely wife Phyllis put her foot down and demanded a little more comfort. She wanted to make sure that a husband could feel comfortable bringing his wife – even his whole family – into our camp. She required hard sided cabins, real mattresses, a porch to enjoy the sunset and a hot shower at the end of the day. She wanted a nice kitchen to cook in, a dining room to enjoy her great meals in. She refused to wander around outside in the dark to find a bathroom in the middle of the night – she wanted a toilet in every cabin, including hers. Naknek River Camp met all these desires, and added a few conveniences that neither one of us expected to have in the Alaskan bush, including phone service for both us and our guests. 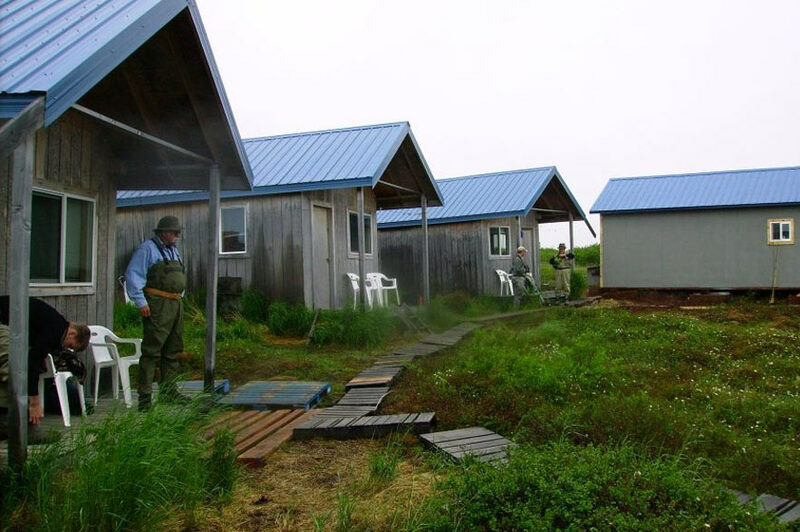 We have road access to the towns of King Salmon and Naknek, offering medical services, a general store, groceries and even fishing and hunting supplies. Our guests even took us out to dinner a few times at one of the local restaurants – sometimes a burger and a beer can be an exotic meal if the burger is an Eddies Firplace Burger and the beer is an Alaskan Amber. Our cabins include towels, pillows and linens. Just bring your PJ’s, your toothbrush, your fishing gear and your sense of adventure. We’ll supply everything else.